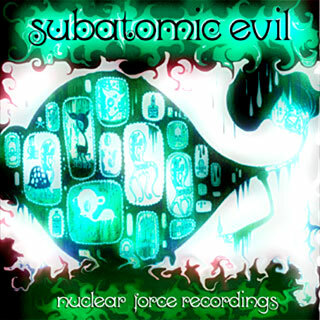 The free compilation Subatomic Evil is the first release from Nuclear Force Recordings, a newly founded label based in Moscow, Russia. Featuring artists previously heard on SamowareZ and Grimorium Verum, the style is firmly entrenched in the darkpsy underground. DJ Skylander and DJ Magnetic joined forces to compile the material for Subatomic Evil, which is released as a “non-stop” mix with seamless fades between tracks. For DJs and fans of high-energy underground psytrance, Subatomic Evil offers a solid selection of killer beats. MP3 Download | WAV Download · Download count: 13,100. Check out the 20 minute preview or download the release in its entirety from archive.org. The individual songs can be downloaded in a variety of formats: FLAC (lossless, equivalent to WAV–see this link for conversion instructions), OGG Vorbis, VBR (variable bit rate) MP3, and (for portable devices) low-quality 64k MP3. Update: looks like this is also available for sale on CD–just follow this link. Hello i just bought this cd in Phokara Nepal and the guy who sold it to me was very pleased with his sale. Cuz the next minut i bought it he’d put the most relaxing cd on that he could find. I liked it very much so. GReat CD. Keep Up The good work. glad to know you bought the CD in Pokhra..i can’t believe you found your way here. I gave out some of these CDs to shops in Pokhra..! haha unbelievable..! pretty good compilation still after all these years.